Three amazing albums, LUNA, Best Of Yoshida Brothers and Inspiration (by ViVA Girls) are now available as a Traditional Instruments Set at Domo Store. In spite of the name of this set, they are anything but traditional except of their instruments. All three albums are the great examples of East-meets-West and the perfect marriage of modern and traditional sounds. Luna performs a traditional Korean instrument, call the Gayageum. With the exception of Luna’s instrument, the music she performs is anything but traditional. With inspired performances and dazzling skill, Luna has become a virtual sensation amassing scores of YouTube views, exhibiting her remarkable ability to bridge Eastern culture with Western influences. ViVA Girls are China’s hottest instrumental supergroup set to take the world by storm with their innovative mix of modern and classical Chinese meets Western musical elements. The majority of ViVA Girls members are graduates of China’s Central Conservatory of Music, the most prestigious in China. Its equivalent would be the Julliard School of performing arts in New York, New York. Yoshida Brothers are the Japan’s young masters of the ancient tsugaru-shamisen, a three-stringed instrument resembling the banjo and with a style originating from northern Japan with intricate and fast picking. The Yoshida Brothers have now taken the tsugaru-shamisen further than any other modern musician, practically reinventing its sound, leading to a musical style both firmly rooted in the traditions of the past and boldly looking forward to the future. 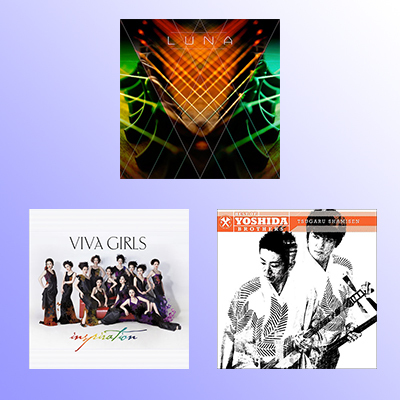 This entry was posted in Luna, STORE, ViVA Girls, Yoshida Brothers and tagged east meets west, Luna, rock, traditional instrument, traditional music, viva girls, World music, Yoshida Brothers. Bookmark the permalink.